To The Batpoles! Batman 1966: #013 Joker & the "gorgeous, dumb hunk of cheerleader"
#013 Joker & the "gorgeous, dumb hunk of cheerleader"
This time we feature "Joker Goes to School" and "He Meets His Match, the Grisly Ghoul," a fun arc that deviates from the formula that the series had established up to this point. Tim and Paul discuss these two episodes well-written scenes and weird errors, and the surprising susceptibility of Gotham’s teenagers to the lure of crime. 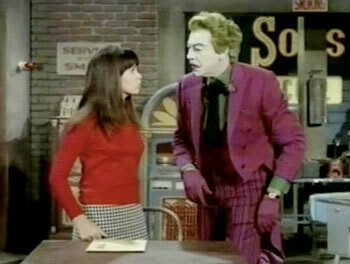 Plus, a quick look at the career of Donna Loren, who plays Joker’s cheerleader moll, Susie.